Despite efforts of food exporters to diversify shipments away from Britain, a hard Brexit remains a major challenge, also for shipments to mainland Europe. The agri-food and beverages sector accounts for about 8% of Ireland’s economy, more than 10% of its exports and about 8% of total employment. The total value of the Irish food and drink industry amounted to EUR 26 billion in 2017, of whichEUR 13.6 billion was exported (up 13% year-on-year). All main subsectors have performed rather well over the past two years. Meat processors have benefited from robust domestic and export demand, including higher sales to Asia in 2018. The dairy segment has increased milk powder sales in new overseas markets, while the highly competitive domestic food retail market has benefitted from robust and growing consumer demand. In 2017 sales to the UK accounted for 35% of exports (down from 37% in 2016 and 41% in 2015), while other EU markets accounted for 33%. The pound sterling depreciation against the EUR after the June 2016 Brexit referendum had negative consequences for many exporters. Meanwhile Irish businesses have started to diversify by increasing their market share in mainland Europe, although that happens at low margins. Despite the efforts of food exporters to diversify shipments away from Britain, a hard Brexit remains a major threat to the sector. Any future imposition of tariffs by the British government on food imports from the EU after leaving could be devastating for the Irish food sector (e.g. exports of cheddar cheese to the UK, valued at overEUR 300 million, would face a 55% tariff). A hard Brexit could also cause delays in shipments of fresh food to Europe, increasing cost and reducing competitiveness (almost 80% of Irish exports to Europe pass via the UK). Shipping live animals between the Republic of Ireland and Northern Ireland would also become an issue. In order to counteract the threat of tariffs in the event of a hard Brexit, Irish companies have continued to acquire smaller UK operators in order to maintain access to the UK market after Brexit.Additionally a consolidation process among smaller Irish food businesses is ongoing. The average payment duration in the Irish food industry is 45 days. Payment behaviour in the sector has been very good over the past 12 months, and the number of protracted payments, non-payments and insolvency cases is still low. 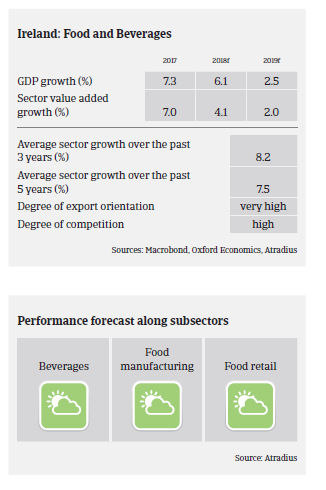 Therfore, our sector performance assessment still remains “good” for the time being. However, as the Irish food sector will remain exposed to further currency volatility and growing risks in relation to the decision of the United Kingdom to leave the EU, we expect both payment delays and insolvencies to increase in 2019. For 56.3% of Irish respondents reported negative consequences of overdues over the past 12 months. For 15.1% of suppliers these led to revenue loss.